You'll be £19.99 closer to your next £10.00 credit when you purchase How the Navy Won the War. What's this? Verdun, the Somme, Tannenberg and Passchendaele. These epics of destruction and futility are such bywords for the First World War that – Jutland apart – we forget the role played by sea power in the war to end war. The great global conflict is too often narrowed to the fields of Flanders and the plains of Picardy. Now, award-winning biographer and naval historian Jim Ring has revisited the story to redress the balance. He emphasises how Great Britain, ‘the great Amphibian’ in Churchill’s words, was able to move its army anywhere in the world. The Navy’s very existence deterred any attempt at invasion, and its great ships kept the German High Sea fleet at bay; lastly, the Navy gradually starved the Kaiser’s nation of war materiel and food. Choosing fourteen turning-points of the war, he explores the relative contributions made by land and sea power to the eventual outcome of the conflict in 1918. For example, the abandonment of the Imperial German Navy’s ambition for a decisive naval surface battle was at least as important as Jutland itself, while Lloyd George’s imposition of the convoy system on, it must be said, a reluctant Admiralty turned the battle against the U-boats; the mine and the submarine altered the course of war as much or more so than the tank. The book is also a study of character as well as of action, of decision-making as much as the sweep of battle, and his critique of the warlords of both the Entente and the Central Powers – of Ludendorff and Churchill, of Haig, Kitchener and Foch, of Fisher, Jellicoe, Beatty and Scheer – is refreshing, his conclusions surprising. ‘The Great War was fought on land but won at sea.’ Not so, says Ring, but much closer to the truth than we tend to believe. A century after the catastrophic events of the Great War, in the midst of a time at which the country is once again pondering its identity, it is worth reciting the words of John Keegan: ‘No Briton of my generation, raised on food fought through the U-boat packs in the battle of the Atlantic can ever ignore the narrowness of the margin by which sea power separates survival from starvation in the islands he inhabits.’ The Royal Navy was key to the survival of Great Britain and to eventual victory in 1918. Written with passion and verve, this book offers a very different way of looking at the conflict – if you think you understand the Great War, think again. 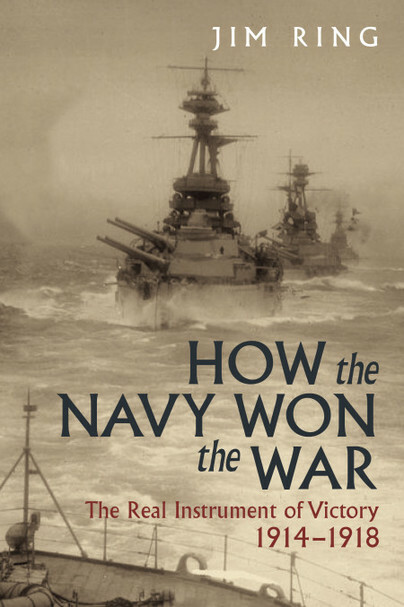 Some readers might not agree with all the author's judgments, but his concise and well-illustrated account is imaginative and thoughtfully structured, placing the naval war in its wider context. As well as engaging the general reader, it will offer new insights for those who are already predisposed to his central argument about the navy's importance in securing Allied victory. Beautifully presented and with some great pictures, it is a book mostly at the strategic level and therefore not one to derive wargame scenarios from expect in the loosest campaign terms. That said, this is an excellent, thought provoking book and one that I would strongly recommend for any reader. This is a book that cuts through the myths and I recommend it to a wide readership, not only those with an interest in the Great War but to those involved in the formulation of an Australian defence policy and its implementation today. JIM RING is a distinguished documentary film producer and successful author. His 2003 book We Come Unseen, about the cold war submarine service, won the Mountbatten Maritime Media Award, while his biography of Erskine Childers (1996) is regarded as the best yet written. He has also written on the story of the British attachment to the Alps and our bond with the French Riviera.